Too rarely is this masterpiece performed. It has a considerable length (usually between 4 and 5 hours) but the plot is well constructed and the music has practically no drops in tension, Meyerbeer creating a vivid intuition of dramatic situations and varied orchestral colours. The production by Andreas Kriegenburg is visually very pleasing, the cube structure fills the stage but feels very sterile, the moving stage allows to see what happens in two different places at the same time, the costumes are also beautiful. But choreography wise it is a bit boring. In Kriegenburg’s production the singers are often motionless, which is the antithesis of grand opera with its dramatic plot and finales and its amount of characters including the masses, who play a huge role. Also, it is not clear why the action should play in 2064. Does he want to say this tragedy can happen anytime? Would this be the only reason? Mariotti conducts well. At least much better than in Berlin. And although i wished a more dramatic rendering of the gloomy and sinister atmospheres (and i also had hoped in some grandiloquence) I still enjoyed his interpretation. Pity for some of the cuts in music. Although Meyerbeer himself didn’t mind and even proposed some of them, as comparison I can say that for the same amount of time, Minkowsky in Brussels proposed an almost complete score). Jaho as Valentine has a beautiful, luminous voice. In the higher register that is, but it sounds a bit empty the lower she goes and her low notes are insufficient for her duet with Marcel and the one with Raoul. Nicolas Testé misses the extreme low notes but sings overall very well. Yosep Kang has all my appreciation for having stepped in last minute. His voice has a nice timbre in the middle register, his French is good, and he fills the huge Bastille room, but the role is heavy and this is audible at the high notes where he pushes the voice to its limits. Excellent Lisette Oropesa (who also steps in last minute replacing Diana Damrau) but has no problems whatsoever, she runs up and down the pentagram with no problems, her voice equal over the whole range, she delivers a credible performance and gets a long and deserved applause after her 2nd act aria. I never quite understood why Karine Deshayes is so praised in her home country. I heard her in Rossini and was disappointed. Meyerbeer suits her much better. I also thought Florian Sempey was very good as Nevers. Overall this Huguentos were not as excellent as the Brussels production (I keep coming back to this one, but except for the ballet everything was perfect, from Minkowsky’s stylistically impeccable conducting, over Py’s dramatic direction to the second cast led by a superb John Osborne with Henriette Bonde-Hansen and Ingela Brimberg) but still a very enjoyable evening. And what a wonderful music!! It was a pleasure to to see this production a second time, if only to see how well Michieletto can tell a touching story and only minimally interfere with the libretto. In this Donna del lago he tells the story with the eyes of old Elena and her secret love to the king. Elena and Malcolm have aged and they witness their own plot, discovering secrets they most likely didn’t tell each other. There were some very touching moments and I loved to see the show in the intimacy of the theatre rather than the huge space of the Adriatic Arena. Mariotti loves the score I feel. The rubati, the small plays with tempi and dynamics bring the score to life and it’s such a joy to hear him direct. The orchestra is far from impeccable but I never heard it play so well (bravo the clarinet). Rodvnanovsky had parts of his voice that sometimes sounded «unclean» (a cold?) but he masters his difficult role with relative ease. It’s more technical mastery, as where Pizzolato, although she lost some of the creaminess of her voice, has not only still impeccable coloratura but plays wonderfully with the colours, and her clear pronunciation makes poor Malcolm become a true romantic lover. Salome Jicia is less convincing than in Pesaro, she attacks her high notes a bit harshly at times, her pronunciation could also be improved but she makes a fine Elena nonetheless with a powerful coloratura and a beautiful closing aria. The small house of Liège is advantageous to Mironov’s voice, not large, but beautiful, light and flexible, sings excellently and in understandable Italian, his second act aria (whose melodic line I always found somewhat strange). Very well also Simón Orfila as Douglas. Barbaric the choir. A couple of days later, with the same singers (Pizzolato, Jicia, Romanovsky, Orfila), Mariotti directed the Stabat Mater. I was not convinced. They all sounded a bit tired I thought. I much enjoyed Orfila, and next to him Pizzolato was the most balanced although with a fatigued upper register. Romanovsky was covered by the orchestra during much of his Cujus animam, but then shouted his cadenza. Salome Jicia did not convince in the upper register. I don’t know what it is, maybe all these roles are too high for her. I much enjoy her lower and middle register, but the runs in premuniri of the Morte Christi premuniri were very unrefined und with little legato. Mariotti pursues his play with dynamics and tempi, but rather unconvincigly this time, in slow movements he slows down even more, in loud parts he is exceedingly loud. A bit disappointing. Direction Musicale-Michele Mariotti, Mise En Scène-Damiano Michieletto, Décors-Paolo Fantin, Costumes-Klaus Bruns, Lumières-Alessandro Carletti, Chef Des Chœurs-Pierre Iodice, , Elena-Salome Jicia, Malcolm-Marianna Pizzolato, Giacomo V-Maxim Mironov, Rodrigo-Sergey Romanovsky, Douglas-Simón Orfila, Serano & Bertram-Stefan Cifolelli, Albina-Julie Bailly, Elena Âgée-Giusi Merli, Malcolm Âgé-Alessandro Baldinotti, 8/05/12 and 12/05/18. Pic from Mr Mariotti’s facebook. Les Huguenots is maybe the most perfect example of Grand Opéra and explains why, in recent years, has been Meyerbeer’s opera with the most revivals (and still not enough IMO). In Les Huguenots (Opéra, Paris 1836), everything blends perfectly together: a grand tragic event where personal conflicts and real historic events come together with much attention to details. Additionally Meyerbeer is master in musically blending French, German and Italian styles. The presence of ballets and the skillful maneuvering of alternate crowd and solo scenes only adds to the “Grand” of the opera. Directing tragic events such as the Saint Bartholomew’s massacre is certainly not easy, but Alden chooses to show us the more trivial things. A musically dramatic scene is shown with singers and choir still on stage which is extremely sad in the third act where the choir has such a prominent role. Not only because it’s a “grand” opera where it’d be nice if the choir moves at least to some extent but especially in Les Huguenots where there are two parties opposing each other. The story is impossible to follow like this. Other times the director makes the characters move in the music’s rhythm in silly movements (the cleaning ladies with dusting feathers…), which distorts the plot, and elicits laughs from the public.The characterization of the single characters, the mass movements, the body language that characters speak to each other, everything is so conventional, without any ideas, very boring. Furthermore the setting to me looked exactly like a granary or a warehouse where to store old, unused rubbish. The chairs folded on top of each other, the horses, the bell….everything seemed to confirm that view. There is a beautiful staging by Olivier Py, getting dusty in Brussels. Why reinvent the wheel (and a ugly wheel that is). Only half of the singers were convincing. I liked Ante Jerkunica. Although a bit short in the higher register, he has a nice bass voice and interpreted very well. Also short, but in the low notes, was Olesya Golovneva. But in her case being short is more damaging because of the importance of her role and additionally i would have wished a bit more colour in her interpretation. Beautiful ringing high notes, though, but not enough to make a good Valentine. Patrizia Ciofi has still some arrows to her bow and sings her entrance aria acceptably (ugly-ish final acuto though) but already her duet with Raoul loses lightness due to her stopping the flow as she is aiming her notes carefully. Juan Diego Florez sings very well, as usually, but coming from belcanto he lacks the right weight and personality and almost authority of the character rendering Raoul almost a bit unexciting. At the end one can hear the fatigue. But well he sings. Very well the Urbain of Irene Roberts in a part excellently sung with a voice well supported. Michele Mariotti, except for rhythmically more intricate pieces which would have required more clarity, supports the singers well but the score never really shines, is not exciting in its musical flow, the lines lose tension and are a bit emotionless. What a pity that il Turco in Italia was such a disappointment this year. Davide Livermore, director of several operas in Pesaro for several years now, transports the opera into a Fellinian movie. Similarly L’Italiana in Algeri of last year was transported into the 60’s, where Livermore had to be careful on keeping the decade’s style. Differently, in Il turco in Italia, by sticking to the fellinian idea, he transforms the Turco-characters into Fellini-characters, adds several characters from the movies and has to match all the different characters among each other and with the libretto. And this sometimes leads to a boring confusion and forced situations that annoy on the long run. The set is beautiful, as are the costumes designed by Gianluca Falaschi. Musically the things don’t enthuse either. Speranza Scappucci does her best to underline the details of the score but directed the singers and orchestra without vivacity. Completely! Erwin Schrott as Selim is more interested in the setting than looking to sing in Rossini’s style…another disappointment. Rene Barbera has all the notes but leaves a bit cold. Olga Peretyatko, who is gorgeous on stage, could have been a good Fiorilla but she does not convince in the first act, let alone in her big aria Squallida veste bruna, which she finishes (badly) with big effort (partially excused by a note she issued saying that this was due to an allergy). Excellent, on the other hand, Pietro Spagnoli and Nicola Alaimo, who, except for an amazingly clear diction, vital for a comic opera, and the only two main characters that care pronouncing properly, understand how to sing Rossini, but alone cannot save the show from a sense of averageness. Ciro in Babilonia was given with a set, also by Davide Livermore, conceived for the ROF in 2012. 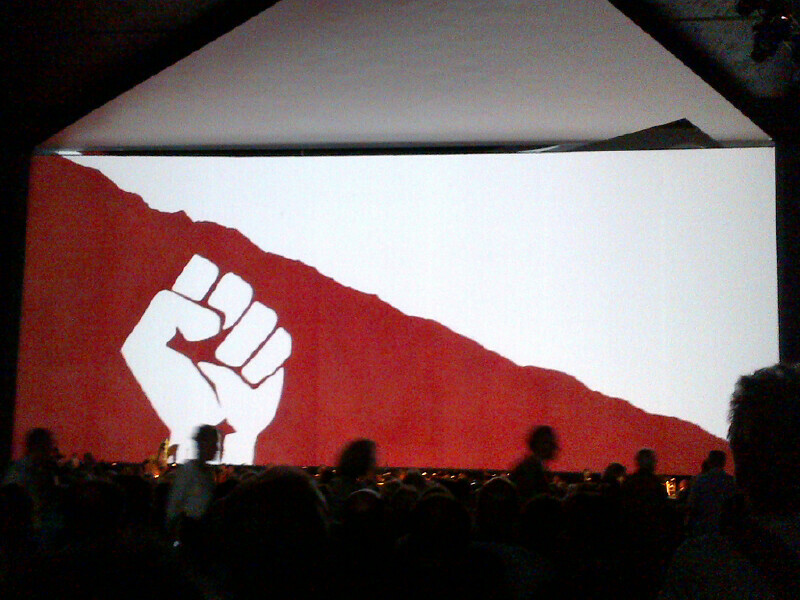 The setting is created around the slient movie theme, with spectators in liberty style, projected intertitles, simplistic acting with emphasized body language and facial expression, and intentionally unrefined projections. it is a very clever direction which is easy to follow and extremely pleasant to watch. Musically Jader Benjamini gives a dramatic though airy and light imprint to this score of the young Rossini and accompanies the singers well. It would be very interesting to hear him in a more mature Rossini. The big star is Ewa Podles. The voice has still an amazing range, I am always impressed to hear both the almost manly-deep and the almost soprano-like high notes in one single voice. Podles is expressive and a very good actress and impersonates not only a Persian prince but a loving father and husband. This is singing with a capital S and shows that Podles has, with over 60 years, still many strings in her bow and she received the ovation she deserved. Siragusa is always quite good with his luminous timbre, fluency in the colorature and attentive to diction. Petty Yende was a nice surprise. The quick florid passages were not as articulated, but she showed a good control in the extreme high register and was overall convining in the Rossinian style. A bigger attention to intonation would have completed her interpretation. La donna del lago was, in my eyes, the most refined of Mariotti s conductions so far. From the first bars of the introduction it is clear that he pays much care to the details of the score, giving much attention to soli’s and accompaniment, uncovering the sounds of gurgling water, “morning dawns”, etc. etc. His tempi are perfect, dynamic and swift, without indulging in superfluous oversentimentality, still tender and warm where required, with an incredible play of rubati and attention to details as rarely heard. It is true what one says about Florez and the coloratura that it is less fluid, but what is lost in flexibility is gained in the search of softness and phrasing, colours and accents. Unmatched. Michael Spyres interprets the extremely difficult role of Ridrigo, cockily shooting high and baritonal notes and leaping over the pentagram as if there was no tomorrow. 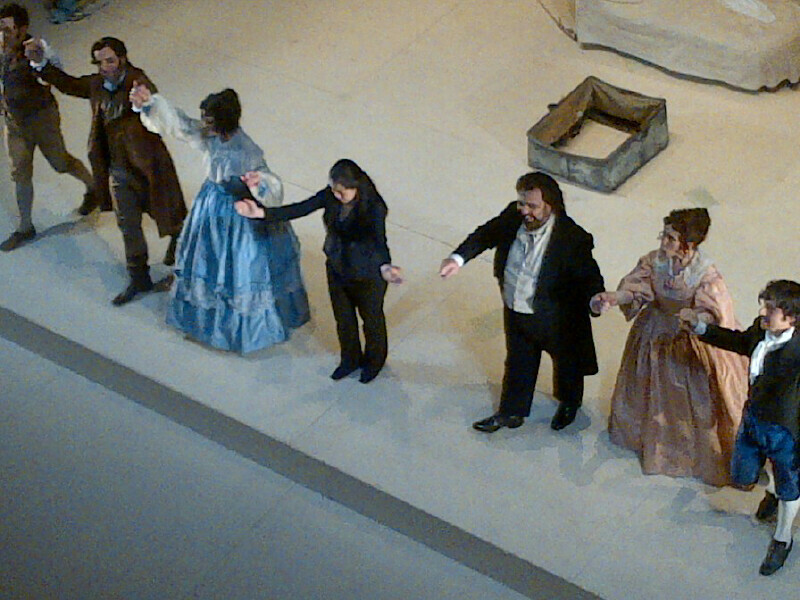 Very good also Salome Jica in the role of Elena, good coloratura and good range. Varduhi Abrahamyan is very good, though lacks, in my eye, these Podles-like fullness in the lowest part of the range. Very good also the minor parts. Michieletto sets the action as flashback. The opera begins with Malcolm and Elena living together in old age, with Elena thinking with regret to the times she met the king. And Michieletto shows what Tottola and Rossini only hint at, a loving relationship between the two, so the whole direction centres around a love that could have been and is (maybe) still there. In the world of subject matter experts a well known theory but Michieletto makes it visible with the attention to details and coherence that is his trademark. The ROF or Rossini Opera Festival: The yearly festival dedicated to the opera’s of that tornado that revolutionized the musical world in 1810-1820. Pesaro is a small and pretty town on sunny adriatic, one eats well, enjoys the sea, in the evening one saunters well dressed in the centro storico or along the lungomare. There is also much music to be enjoyed and the happenings are semi-chique considering that one can sip Prosecco next to Alfred Brendel, be seated in a box next to Raina Kabaivanska or ask Patsy (aka Joanna Lumley) to light one’s sigarette during the break. 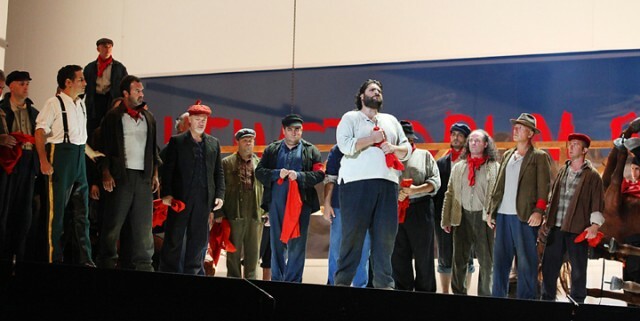 The 3 opera’s of the ROF 2013 are Guillaume Tell, L’occasione fa il ladro and L’italiana in Algeri. This year’s big attraction was meant to be Guillaume Tell. “Un’opera strana” was a comment from two well-read opera aficionado’s behind me. And one of the first Grand operà’s is indeed a little strange, with strikes of genius but also with long choral passages and little action. One can try to explain this with a mediocre libretto, or Rossini’s difficulty to adapt to the French style. The opera is undeniably quite long and includes the women’s terzetto in Act 4 and Jemmy’s aria in act 3, two often cut pieces. Much has been written and discussed about Florez’s interpretation of Arnold, as the role is long and difficult, and his vocality does not seem fit for this heavier role. But he gets through the role and the first 3 acts without major problems. He sings a very moving Asile hereditaire in Act 4 but a mechanical Amis, amis in a discrete French. Big personal success and much applause of course, but Florez is an absolute star in Pesaro. I felt that Marina Rebeka’s voice was less controlled than in Amsterdam a couple of months back, with slightly screamed high notes and less precise coloratura (Mariotti’s tempi did not help) but she sang with a strong and steady voice. Like in Amsterdam, I did not like Nicola Alaimo as Tell, his stage presence and voice were not important enough to interpret the Swiss hero, neither in the heroic, nor in the more lyrical moments. In this Guillaume Tell, Jemmy’s aria, which is often cut, is re-introduced, but the game isn’t worth the candle neither for the piece on its own nor for the interpreter. Amanda Forsythe, whom I vividly remember as a spirited and sparkling Rosalia in L’equivoco stravagante in 2008 (Pesaro) sings well and with a good stage presence but with little voice and reducing the aria to a coloratura showpiece. The other singers were adequately cast although some of them had an execrable pronunciation. The musical director Michele Mariotti starts with a well directed Ouverture, playing with well placed rubati, but as already said, the opera is long and needs a director who is able to keep the suspense down to the wire. Although undeniably a good director, Mariotti had some odd choices of tempi and was not able to span the musical arch to the end. Graham Vick’s direction is all based on socialist symbolism and a repeated display of the Habsburgs’ violence and humiliation over the Swiss. It’s a bit repetitive at times but it does not necessarily disturb the action. It is in fact quite conventional, occasionally even trivial (the stairs at the end; the soppy movie of Arnold’s father…) but the ballabili were very moving and well danced, although part of the public did not appreciate them, booing the dancers (shouldn’t they boo the director instead??). All in all, nothing to get overly excited or overly disappointed about. Just a bit too much. L’occasione fa il ladro: One of the loveliest of the farse written for the Venetian teatro San Moisé, if you ask me. It is clear from the music Rossini forges for this short opera (eg the elaborate aria for Berenice and intricate second finale, which comprises several different musical structures) that the short form of farsa (a comic opera usually in one act, originating in Venice or Naples) was too tight to Rossini’s musical fecundity and inventiveness. The production is the one Jean-Pierre Ponnelle created for Pesaro in 1987. It is based on simple and traditional acting with painted scenes and few props. The group of singers reunited is a mix of young newcomers like Enea Scala and Victoria Yarovaya, and more recurrent ROF singers like Roberto de Candia and Paolo Bordogna. The cast is good although one could pick about the insufficient coloratura di forza of one, the strained voice in the higher register of the other, the slight backwards voice of a third or the somewhat stiffness in acting of a fourth. But the group effort made it a very enjoyable musical evening. I would like to mention Elena Tsallagova in the role of Berenice. She sang the loveliest Arpa gentil I ever heard life, in the 2011 Viaggio a Reims production in Pesaro (the yearly performance given after the seminar dedicated to interpretation of Rossini’s music). Unfortunately she made a bad choice with Contessa di Folleville of the same opera in Ghent in 2012. With her Berenice I found again the beautiful and pure voice I heard in 2011. Her coloratura can be impeccable if she finds a director who gives her the time to deploy it properly. Given a wise selection of adequate roles (belcanto, mostly, I hope) I wish Ms Tsallagova a very fruitful career. The (female) musical director was Yi-Chen Lin, who directed with precision and supported the singers . The third opera was L’Italiana in Algeri, which Rossini, already a small celebrity now, after the successes of Tancredi and La pietra del paragone composed for the Venetian Teatro San Benedetto in May 1813. Unfortunately the musical direction of this Italiana was given to José Ramon Encinar who directs in an unimaginative, lifeless, tedious and vigor-less manner. Never have i heard the Comunale di Bologna play so mechanically and with so little energy.